Welcome to this page dedicate to the dolls and toys from the movie, The Book of Life! When I first saw the production stills for this film, I was super excited. It looked original and unlike anything that has been released yet. Following the story of young love caught up in a world of death and remembrance, we journey through worlds unlike our own...and what's more, it all looks absolutely beautiful. The Book of Life is sure to be a massive animated hit for this Halloween season, and beyond. With stars such as Guillermo del Toro, Zoe Saldana and Channing Tatum involved in the project, this offering from 20th Century Fox is bound to do very, very well at box offices across the entire globe. As an animator, I'm fascinated by the art form, the story and the whole process of taking a simple image and turning it into a film, but more than that...I'm obsessed with the dolls and toys that come with every great animated film...and I'm super excited about The Book of Life dolls and toys, the characters are so beautifully created. Right now, there isn't a huge amount of The Book of Life dolls and toys available, but there will be more. So keep your eyes peeled, and add this page to your favourites, as I'll be keeping it updated when more and more exciting merchandise gets released. I can't wait! In the mean time, if you're feeling impatient, you can always pop along to Amazon.com's doll and toy page, for The Book of Life, right here, now! do you like the look of the most? Are you a fan of the Channing Tatum character, Jaoquin? Or are you most excited about the main man, Manolo? 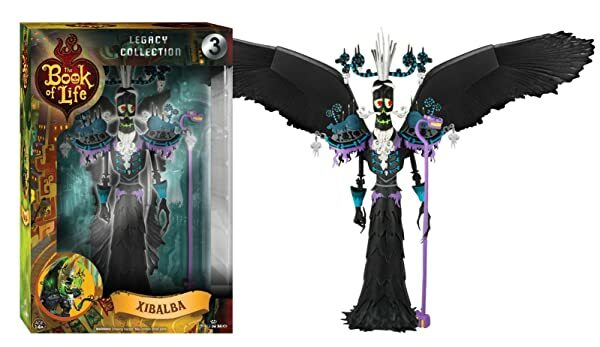 Perhaps you like Maria, or even the mighty Xibalba himself? Add your vote right here now! 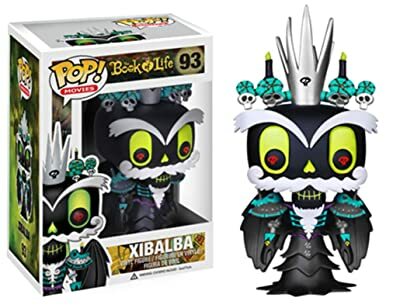 Book of Life, Funko Legacy Action Figure DOLLS! Oh my goodness! How beautiful are these action figure dolls for the release of The Book of Life? 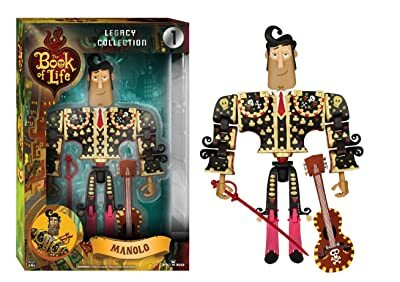 I adore this figure of the animation's hero, Manolo. The attention to detail is exquisite. And you know what else, the figure boasts 20 points of articulation - which to you and me, basically means joints - so you can pose him around into whichever position you prefer! Again, just adding to the glory of this fab Book of Life doll. Perfect for any animated film fan! 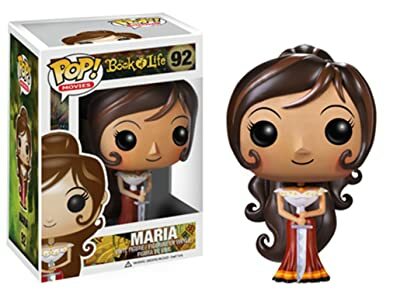 Those clever people at Funko really know what they're doing when it comes to creating the dolls for one of Fall 2014's most anticipated animated films, The Book of Life. Like the Manolo doll above, this Maria doll has 20 points of articulation. What's super cool about this, is that if you get more than one, you can start to pose the doll characters out to replicate your favourite moments from the film. Isn't that just the sweetest idea? Fan of the movie or not, this doll will add a certain je ne sais quoi, a certain class to your doll collection. Gorgeous! Have you seen the fabulous trailer for THe Book of LIfe yet? I can't stop watching this Book of Life trailer! Potentially, the most visually arresting animated movie to come along in the longest time. The colours and style are second to none...the story is timeless...give your eyes the visual feast they deserve! Watch the Book of Life trailer right here! 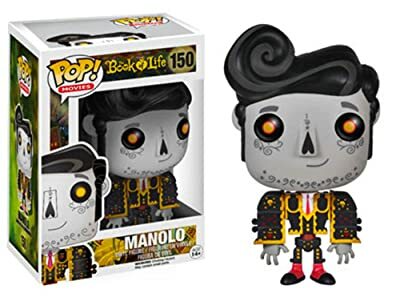 Now this is exciting...Funko have created not one, not two but three The Book of Life Legacy Action Figures so you can collect the full set of film heroes! If you thought Manolo's design was intricate and beautifully detailed, then you ain't seen nothing yet! Check out the detailing here...amazing, right? If you are gifting hunting...any doll collector, or movie memorablia fan will adore this. Heck! Just get all three! Funko Pop! The Book of LIFE Dolls and FIGURES! What would a great animation be without it's Funko POP! action figures? They've given their figures a gorgeous The Book of Life treatment, and they look stunning. Whether you are collector of animated character dolls, or films in general...or perhaps you just collect Funko POP! dolls, either way, this one is a must. As the lead character, Manolo, from the movie, this little guy should surely be the one that gets snapped up and given pride of place on your shelf...or wrapped up as a gift for your loved one. I want one so badly! Looking at La Muerte, you would be forgiven for thinking that there is anything depressing about dead character. How bright and amazingly designed is she? La Muerte plays a significant part in The Book of Life, so by adding her to your doll or toy collection, you're making a wise move. Voiced by one of Mexico's most successful actors, Kate del Castillo, this character is all about celebrating the past, and looking to future...isn't that such a fabulous philosophy? The legendary Ron Perlman, lends his voice for this Book of Life character...and what a fine character he looks too. Looking a little bit like a gothic santa in drag, again, there isn't much too depressing about this dark character. As a significant character in the story, this doll would be an excellent addition to a movie doll collection. ...I mean, he can't be that evil, can he? He has an upside down heart for a nose! Cute, right? Funko Book of Life Doll Review! That fabulous youtube duo, MommyandGracieShow have done the honours by reviewing the Funko Pop Book of Life dolls! So, you can see for yourself which are the best ones ot buy...although, secretly, like these ladies, y'know you're just gonna buy them all, right? Thanks ladies, for the review! 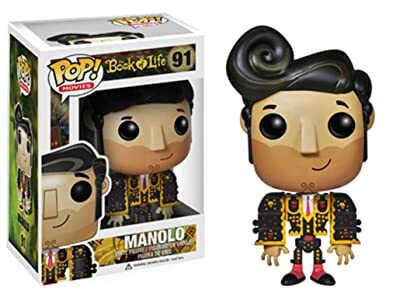 Funko have gone all out with The Book of Life and even created two Manolo figures. You have the alive Manolo, and the remembered version, which is right here for you! Personally, I really like this one. Kind of morbid, yes, but so, so beautiful. I love everything about the style and the concept behind this movie and the characters, and what a fantastic way to bring a positive spark to remembering those before us. This little guy will look perfect in any collection of movie dolls, and although standing at a humble 3 and 3/4 inches, this doll is perfectly formed. There's something super special about the Funko dolls, and it's clear to see why! Here with have the beautiful Maria! Doesn't she have the biggest hair the animation world has seen since Rapunzel? Ok, it's not long, per se, but compared to her body, it's pretty big! 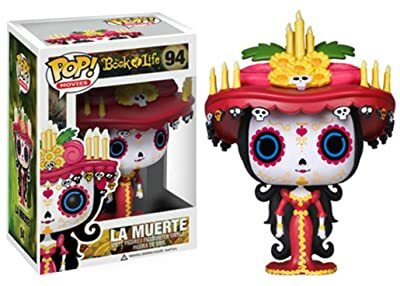 Another fabulous addition to any Funko, or Book of Life doll collection. If you watched the fantastic review, just above, she is the first doll the ladies talk about...and you'll notice that she's quite tricky to stand up - due to her massive hair! But fear not, those clever folks at Funko have included a little stand to help! Genius! How Gorgeous is this artwork from The Book of Life movie? 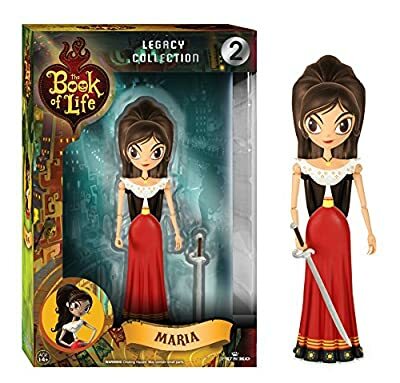 keep checking back for more BOOK OF LIFE DOLLS & TOYS! In the mean time, after you've bookmarked this page, or added it to your favourites, take a look at some other exciting pages full of dolls from more animated movies, that you will love!